So where am I going? To Chicago! 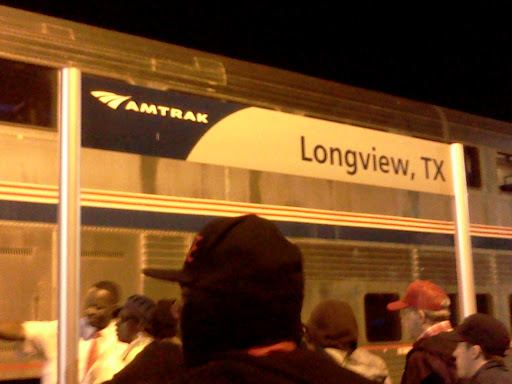 I’m taking the train to Chicago from Longview, Tx to attend the AWP conference. In fact, I’m writing this post on the train now. We’ve stopped briefly in St. Louis, MO. Before I continue with this post, I have to say I had already written it. I wrote this post originally on my iPad app but somehow, as it was posting, it got lost and never posted. Imagine in my surprise…. So what did I say? I made the case for train travel as a way to people watch. As we all know I love to people watch. I call that collecting characters. Everyone has something special about themselves and when people aren’t watching, that’s when that special jumps out at you. You just have to be patient. Take for example one of the first characters I collected on this trip– an older gentleman at the depot. He was old, graying at the temples, and his world began and ended at his walking cane. He was blind and his smile was the length of the train track behind him. He was on his way to Chicago as well and seemed like he’d done the trip a couple of times. His stutter was adorable, he laughed through the difficult words. What is so remarkable about this man is that through what some folks would see as challenges, he is smiling and adoring his life and the conversation he was having. What happened in his life to get to this point? Was he always blind? Did he always stutter? That’s a character. He needs to be written. I find him fascinating and worthy of words. 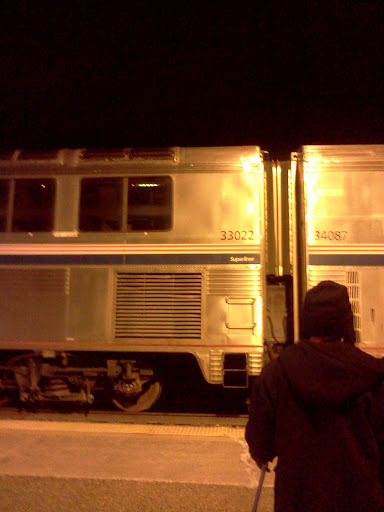 Don’t know when I’ll use him, but I will one day and it all started at the train depot. Another character was an older woman from Texas I had the pleasure of having breakfast with. She was well-dressed in her demur lime green suit, her glasses dangling from her bejeweled chain. Her eyes were a dashing blue and her silver hair was tousled after a night of sleeping on the train. I sat down across from her and had a conversation. She told me about her children — three. Where she was going — Washington D.C. Who put her on the train–her daughter and all the other information one talks about with strangers. And then we started to talk about our lives, where we lived, what we’d seen and what we thought. She was your typical Southern woman with a sophistication you only see in people north of the Mason-Dixon. She’s seen a lot and experienced more. She was a revolutionary wrapped in a grandmother’s body. She’s worthy of words. I love collecting characters, it’s like building up an arsenal. I don’t know when I will use these characters or if I’ll use them as is or parts of them, but it’s nice to know I have something to pull from. Write on everyone and I’ll see you in Chicago! Collecting characters was fun but I have to admit,being on that train for that long was nuts! I get to do it again in a couple of days.